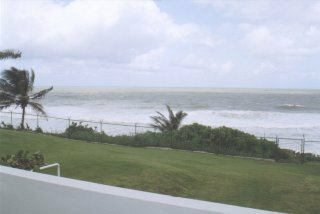 This well appointed 3 bedroom, 2.5 bath vacation rental home is located in the exclusive Costa Dorada development in Dorado, Puerto Rico. Oceanfront to the beach, this multi-balconied house provides magnificent ocean views. The house is fully equipped with all amentities including air conditioning, fully furnished outdoor patio, large yard and two parking spaces. The Embassy Suites Dorado del Mar Resort complex with casino is available nearby with easy access to hotel amenities and services. Golf course use fees includes golf cart. A 3 bedroom (1 king, 2 queen) 2 1/2 bath vacation rental home with fully equipped kitchen, Air Conditioning, Cable TV, phone, washer & dryer, dishwasher, ocean facing balcony, outdoor patio furniture, hammock, air purifier, two parking spaces, and much more...located in a quiet secluded and secure neighborhood in Costa Dorado, Dorado Puerto Rico. Rates: Weekly $3000. Monthly $4000. This home is available for corporate rental terms. 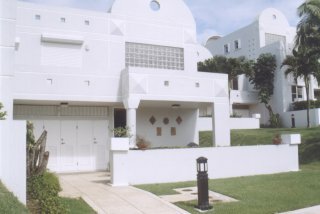 The complex where this home is located along the beautiful beach in Dorado, Puerto Rico. This is a mostly private beach just west of the San Juan Metropolitan Area and near the Embassy Suites Dorado del Mar Beach Resort and the famous Hyatt Dorado Beach Hotel & Casino and the Hyatt Regency Cerromar, each with two 18 hole Robert Trent Jones Championship Golf Courses. This beach is suitable for swimming, snorkeling, wind surfing, jet skis, and other water activities.